Another Chunk-O-Vision™® effort from MatGubbins. I can’t be arsed to review it, so here’s a screenshot. You can probably guess the rest, but if not, here’s another screenshot. If you want to know what happens next, download the .tap here. If you can be arsed. Score: 23 hours and 59 minutes’ sleep out of 24. 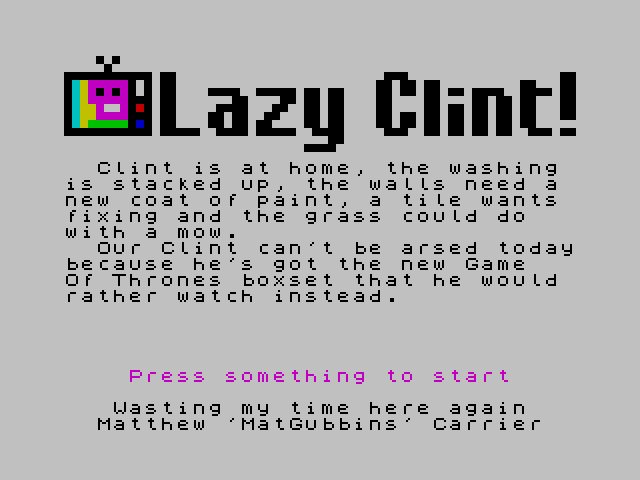 Introducing one of the fastest sequels to hit the Speccy, MatGubbins brings us the next instalment of our hero Clint in this 10-char keyword challenge. Horace had his Spiders, Clint had his Crabs. Sabreman had his Wulf, now Clint has his Foreskin to contend with. In this particular case, the nemesis Dr. Foreskin (pronounced Foh-ress-kiyne – obviously! Doh!). The title page explains all, but basically our budding protagonist was rescued by a Doctor who suffered a severe upbringing as result of his much mocked surname that he’s decided to take it out on any random shipwrecked blighter that he might happen to stumble upon! And so it is, Clint finds himself on your stereotypical moving platform which randomly moves side to side. In the top left is Dr. Foreskin taunting and generally throwing rude remarks at you a la Monty Python Holy Grail (French Scene). Unfortunately, no vaches are to be seen though. Clint however needs his wits about him if he is to stay on the platform (using A and D keys by the way) and not fall to his demise on a row of deadly spikes below. If you can manage this long enough, the platform reaches the other side and raises up a level just to repeat the process. If you can hold on for long enough, you will be able to jump on a conveniently located boat and escape. 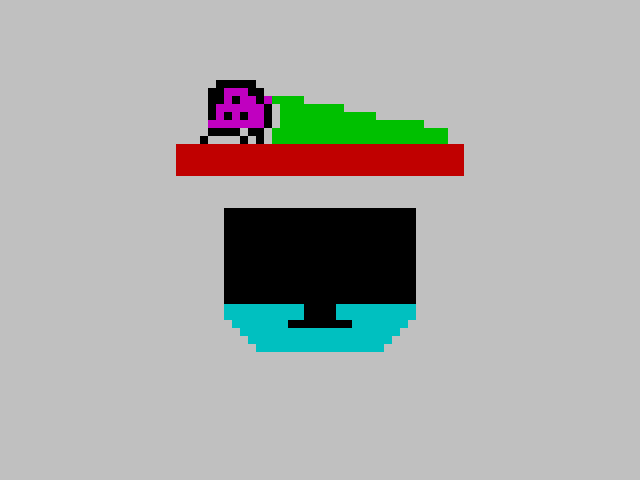 So, unlike the first game in the series, this one is written in BASIC with a few UDGs thrown in. A very pretty title banner on the title makes good use of colours and the game itself looks half reasonable. Game physics however have a little more to be desired. The platform on which you stand appears to move completely at random and so you can be waiting a long time doing your little back-and-forth dance while you wait for the platform to reach the opposite side, just to have to repeat the process a few more times. In summary, a reasonably crap game although a little too polished to take the crap-pot. We are looking forward to see what capers Clint appears in next. Let the saga continue! Grab hold of your foreskin here! Score: 1 skin… 2 skins… 3 skins out of 4 skins. F’nar!